Manchester United have sent a message wishing their former player Paul Scholes good luck after the news today that he’s been appointed the manager of Oldham Athletic. The 44-year-old has mainly worked as a pundit since retiring from playing back in 2013, and it will be intriguing to now see how well he fares in the dugout himself. Known for being a harsh and brutal critic, particularly of recent Man Utd managers Jose Mourinho and Louis van Gaal, Scholes will now get his own taste of what it’s like trying to get the best out of a team. One of the finest players in United’s history, its nice to see the Red Devils thinking of him as he takes his first steps into management. Many fans will no doubt hope to see him do well and perhaps return to Old Trafford in the future, though another of their former stars, Ole Gunnar Solskjaer, is currently doing that job very well indeed. Instead, most fans seem to be making the same joke about Scholes becoming a manager just as Mourinho turns to punditry after recently leaving MUFC. Suspect we may see/hear the first forensic analysis of Oldham Athletic from Jose Mourinho before too long. He is not the type to forget. Reports that Jose Mourinho is currently checking availability at the Premier Inn, Chadderton, ahead of Oldham v Yeovil tomorrow night cannot be confirmed. Scholes is a manager, Mourinho is a pundit. It is going to be a lot of fun. 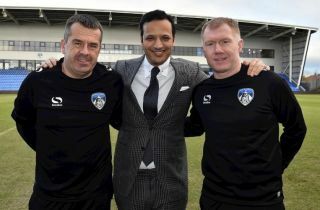 Paul Scholes appointed Oldham manager. Get Mourinho on BT Sports and start broadcasting League 2 games. Mourinho patiently waiting for Paul Scholes Managerial career to go south.